Carissa Park’s is designed to wow the people with its lush foliage and landscaping. 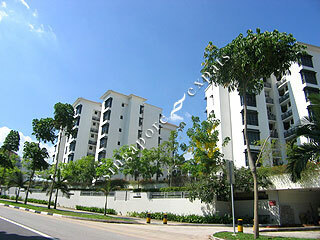 It is located at Flora Road which is near Changi Airport, east of Singapore. The facade characterises a modern contemporary resort style set amidst a matured landscaping and complete facilities. Each unit is meticulously designed to cater to residents modern tastes with warm timber stripped floors for bedrooms and off white marble tiles in the main living area. Carissa Park is accessible via the nearby expressways - Pan Island Expressway (PIE), Tampines Expressway (TPE) and East Coast Parkway (ECP). It takes only 5 minutes or less to commute to the Changi Airport. It takes about 5 minutes drive or bus ride to the nearest Simei or Tampines MRT station. Nearby amenities include Loyang Point, White Sands, Tampines Mall, Century Square, The Japanese School Tanah Merah & Laguna Golf and Country Club. A nice and peaceful ambiance.